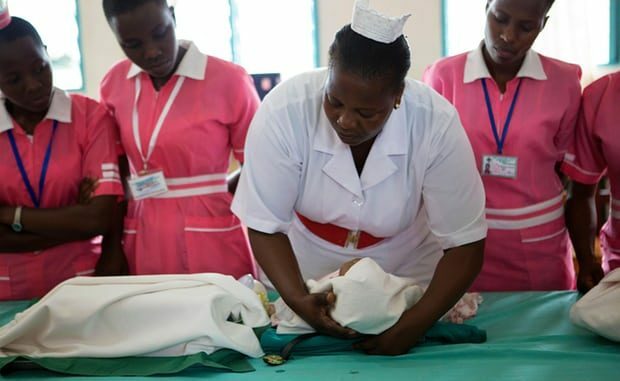 The failure to stop a brain drain of almost 2,000 of its best doctors and nurses is exacerbating Uganda’s healthcare crisis, reflecting a growing problem across east Africa, say healthcare workers. At least 1,963 medics are being recruited to work at one hospital alone in Libya, as Middle Eastern countries turn to the region for highly qualified workers to fill their own vacancies, which have increased amid political instability and migration. Nurses, laboratory technicians and doctors in different fields are being recruited from public health facilities, private hospitals and the not-for-profit sector, with no clear government plan to mitigate the impact on the domestic health sector, medical workers say. “This one [Libyan] deal, if executed, will worsen the shortage of health workers, undermining service delivery and the investment by donors to the health sector,” said a statement from the Uganda Civil Society HIV Prevention Advocacy Coalition. Dona Anyona, of the health system advocacy partnership at Amref Health Africa, said: “It’s not the right move, given the understaffing and its resultant impact on healthcare service provision. Uganda continues to face a severe shortage of critical health workers, according to the health ministry. The national health system performs poorly and staff encounter challenges with accommodation and transport, not to mention months without pay. On top of that, health facilities lack adequate medicines and proper equipment. Just 69% of health posts are filled (pdf) according to figures for 2015. In 2013, the doctor-to-patient ratio was estimated at 1:24,725, with a nurse-to-patient ratio of 1:11,000. The World Health Organization (WHO) recommends one physician per 1,000 people. Although the Institute of Public Policy Research Uganda, a thinktank, sued the government in 2014 to stop the loss of 263 health workers to Trinidad and Tobago, that court case is still pending, and some 3,000 medics left the country between March and June this year alone, according to estimates from activists. The brain drain of health workers from east Africa is caused by local private recruitment agencies that broker deals mainly with Arab countries – arrangements it is difficult to prevent. “As a government, we can’t stop health workers from going to work abroad if they want to. Since we have free movement of labour in Uganda, there is no reason as to why we can stop them from going,” said health minister Sarah Achieng Opendi. Every year, at least 320 medical students graduate from Ugandan universities, more than in any east African nation. But public hospitals are very short staffed. “Uganda’s health worker crisis is caused by multiple factors. The government refuses to provide adequate pay, health workers are not deployed to the areas where they are most needed, and many lack the tools and support to do their jobs effectively,” said Russell. The medical brain drain is not restricted to Uganda – but common across sub-Saharan Africa. A 2011 study found, for example, that 77% of physicians who had trained in Liberia were working in the US. Meanwhile, HIV activists have criticised the labour ministry for allowing recruitment agencies to insist that applicants undergo an HIV test, which is against Ugandan law on the workplace.